Phyisican's Formula is one of my favorite drugstore brands, it's affordable, quality products, and you can find them down the aisles of your local store. Does anyone remember when they put out that powder with a Marilyn Monroe face imprinted in it? I searched everywhere for that! 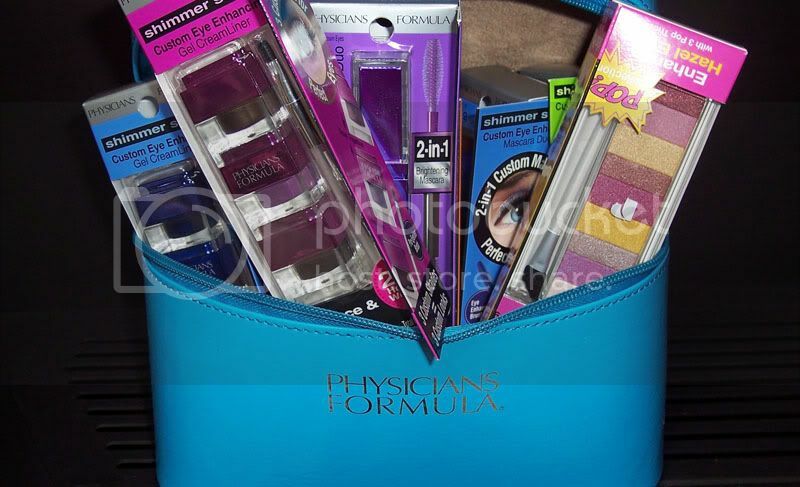 I've always thought of Physician's Formula as a "neutral's line" geared more towards natural beauty makeup, but their new Eye Color coordinating Shimmer Strips products feature vibrantly bold hues of eye popping color that rival their high end counter parts.Check it out! Swatches & full Shimmer Strips Line Review behind the cut! Three custom shades provide a glamorous look to define and enhance your eye color. Long-wearing, water-resistant and smudge-resistant formula provides 24-Hour definition. Includes Pro-Eyeliner Brush for effortless and precise application. Stackable eyeliner pots can be pulled apart for individual use on-the-go. These are great quality gel liners for the price! It averages out to under $4 a piece. They glide on smooth & pigmented, much like MAC fluidline's with their 'gel' formula. A little note is that the black in each of these trio's contains some light shimmer/micro-glitter (i.e. green set is black with green glitter). It's not terribly visible, but worth noting. The brush is great for thick lines, but not the best for thin application. Each set has a black with glitter, bold color shade of purple or blue, or a brown/taupe. 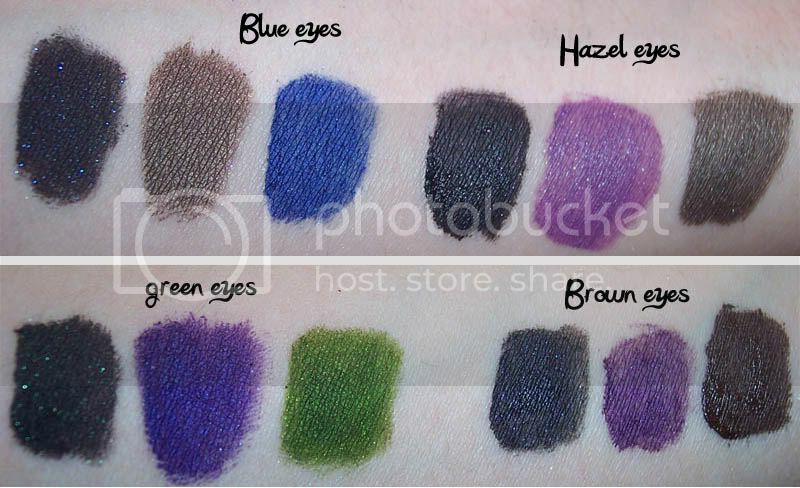 My favorite is the "Green Eyes" set, the grassy green is a very unique shade, and the purple in this set is much more vivid than in the others. Followed closely by "Blue Eyes" for it's starry night black with blue glitter and cool toned shimmery taupe. 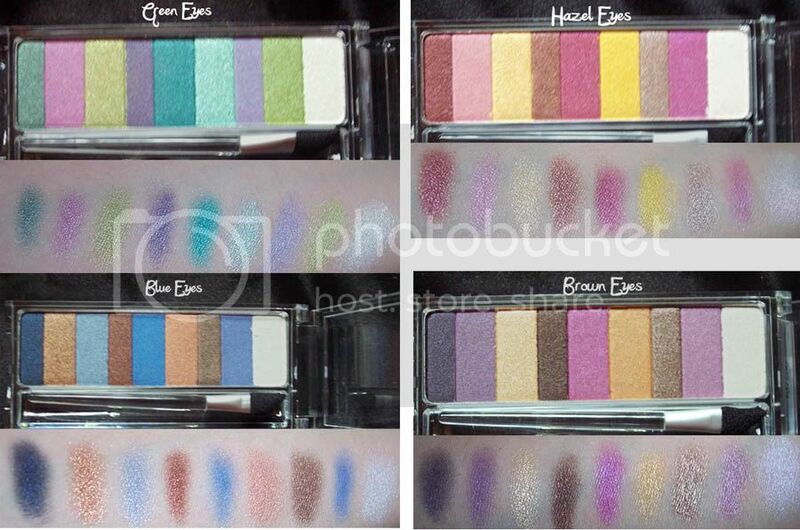 Your eyes will illuminate with these fun and bold palettes of bright eye enhancing color! Three blendable trios perfectly paired to color, contour and line your eyes for illuminating, high impact. These cute 9 pan palette's of shimmery shadows reminded me a lot of Bobbi Brown ShimmerBrick's, but for a whole lot less! I really like how the colors are all over the board, but work well together at the same time. The "white" highlighter shades in each set is actually a duo-chrome which is not seen a lot in most drugstore offering's. The shadows are pigmented, non chalky, and not overly shimmery. They apply beautifully over a base with no fall out, and they can be applied wet for even more intensity. My only dislikes are that there's no separator's between the shades, and being all "shimmer" finishes I have to pair them with matte's in my collection as I don't like all shimmer anymore. That little brush is fantastic! It's awesome for creating a nice outter 'V' shape in the crease. Never knock a sponge app. they have their place! Overall, these are great little palette's, especially for those just breaking in to color. The shadows are pigmented, but still wearable. Don't worry about the "Eye Color", any one can use these products, just pick the shades you like best. My favorite is the "Green Eyes" set, the teals & greens are gorgeous. I also like "Hazel Eyes" for it's jewel toned browns & golds. My least favorite was "Blue Eyes", the blue's are very dull and I didn't care for the overall color scheme. Dual-ended volumizing and lengthening mascara enhances eyes with illuminating color for ultra-dramatic & glamorous lashes. Perfectly coordinated shades can be used alone or used together for multiple looks & customized lashes! Sweep black mascara onto lashes for a natural, radiant look. For a more playful look, apply eye enhancing shade onto lashes. For the most dramatic effect, first apply black shade to lashes and then layer eye enhancing shade on top. Apply multiple coats for added definition and drama. This mascara has one end black and the other is a coinciding eye color enhancing shade The black has a really unique brush that provides volume to the lashes. I don't know about you, but I've always been disappointed with colored mascara's, but these actually apply pigmented and give a nice subtle flash of color. All products are Hypoallergenic. Dermatologist Approved. Fragrance Free. Paraben Free. Safe for Sensitive Eyes and Contact Lens Wearers. They retail for around $10.95 each at ULTA Beauty and other Store Locations. Look out for future looks to come using these products! Review contains a sample provided for consideration by a PR firm or representative for the company.